cost and sensitivity cost analysis. A key tool for managers, decision-makers, engineers, ILS personnel,and other staff involved in system acquisition, proposal writing, management, development, production and through-life support. DOWNLOAD FREE DEMO Presents all D-LCC features. "The identification of appropriate software was crucial for our LCC project. Several software vendors were researched. D-LCC was the only product, exclusively engineered to address LCC, but not specific to a sector, industry, or technology. D-LCC also answered our criteria: flexible enough to build a model 'from scratch', since 'canned' models all contained legacies of disappearing procurement paradigms, and powerful and user-friendly enough to allow model-building expeditiously." Life Cycle Cost (LCC) analysis and Total Cost of Ownership evaluation are the basis for decision making for the wide range of industries and equipment: from IT systems to submarines. LCC analyzes the total ownership costs of various design alternatives and system's components over the projected life cycle of a system. • Product Tree Cost Calculation option allows for incorporating the Product Tree parameters in LCC model and calculating any required cost elements (like spare parts cost for each Level of Repair) across all Product Tree items. Sensitivity Analysis: D-LCC Sensitivity Analysis option in computes changes in the LCC/TCO according to changes of any global variable. The sensitivity analysis identifies major cost drivers (Pareto "vital few"), supports trade-off analysis and indicates the effect of altering critical parameters and assumptions. Cost-Effectiveness evaluation: Managers are interested in cost-effectiveness which is typically calculated in terms of performance per unit cost. D-LCC's Cost-Effectiveness module provides this insight as well as other effectiveness measures. 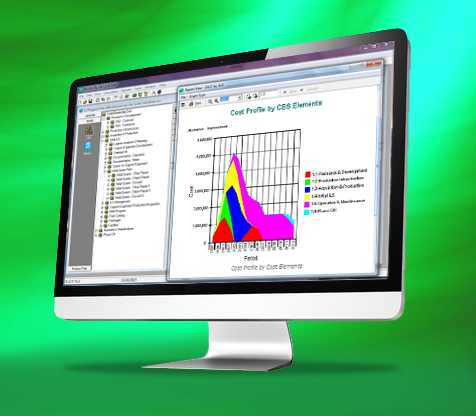 Cost Item analysis: D-LCC provides a utility to calculate the costs of a particular budget line item. This "Cost Item" function computes the contribution of any item, such as labor, or material. Results are reported at the element level and rolled up into a project total. Optimal Repair Level Analysis (ORLA): D-LCC includes a powerful ORLA module for calculating the cost and effectiveness of various Level of Repair alternatives per product tree item, thus supporting optimal decision making. • Global change for all required elements -- by changing a global variable, the user can immediately update many items throughout the project. • Alternatives library -- a list of all possible alternative decisions, policies, etc. • Global Variables library -- a set of Global Variables valid throughout the cost model and affecting many cost elements, e.g. escalation and discount rates. D-LCC is data compatible with other ALD packages for Reliability, Maintainability and Logistics Analysis such as RAM Commander.